Walking on the Bera Bach Ridge, Yr Aryg, Garnedd Uchaf, Foel Fras, Foel Grach, Carnedd Llewellyn and Yr Elen and thoughts about mountain safety. It had all started in the summer of 1988. For many years we had spent our summer holidays in Lyme Regis and had enjoyed many walks east and west along the coastal path. However, in early 1987 our eldest son, Greg, had been with his primary school for a five day stay in North Wales. Having thoroughly enjoyed the visit he had persuaded us to go there in the summer to enjoy the delights of the Gwyder Forest and Cwm Idwal, which had left a great impression on him. And so August 1987 saw Greg age 12, Ian age 7, my wife Anne and myself visiting Snowdonia. This visit was the start of many visits. The following year we were there again having found a good base at the Princes Arms in Trefriw. From here we started to walk some of the "tops". Our first was from Rowen on to the Tal-y-fan which at 2001 feet just sneaks into what we would define as the minimum height, 2000ft, for a Welsh Mountain. From the top we had wonderful views towards the sea and the Great Orme at Llandudno and were able to enjoy the vista of the Conwy Valley. The rest of the Carneddau seemed so large and the thought of walking those distant heights seemed most unlikely. However, we had caught the "bug". This was the start of our lust to visit more and more of the "tops". Over the next few years we visited many of the mountains. I had read "I bought a mountain" which, besides telling the tale of pre World War II farming in Snowdonia, has a very good description of completing all the 14 Welsh Mountains over 3000ft, or 15 if Garnedd Uchaf is included. The author did the walk in a time of 8 hours 25 minutes. Since then various other people have bettered this time and I understand the current record is held by Josh Naylor who visited them all in 4 hours 46 minutes. As the distance is about 30 miles and the total ascent is well over 10,000 feet it is an enviable record. Following our various forays into the mountains I realized that a good day on the Carneddau and a walk across Crib Goch and I would have bagged them all, although not quite as quickly as Josh Naylor. 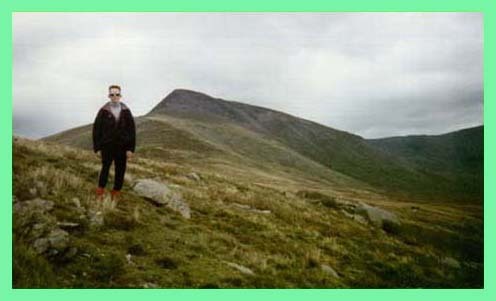 So August 1993 saw us back in Trefriw and Greg and I getting frustrated as the weather had not been good and trudging the Carneddau in rain and mist was not very appealing. However on Monday, 9th August the rain had stopped. It was misty, but sunshine was expected later in the day, so, accompanied by Greg - Anne and Ian had decided to give this trip a miss - I drove to Gerlan, located above Bethesda to "bag" Garnedd Uchaf, Foel Fras, Foel Grach and Yr Elen. Although the original intention had been to climb onto Gyrn Wigau and walk the Drosgl Ridge, because of the mist still on the hillside we continued on the pathway we had followed from Gerlan along the north side of the valley of the Afon Caseg - the River of the Mare. However, we realised that before too long we would have to venture upwards onto the ridge. When we started going up we were accompanied by a wild pony, which seemed to take great pleasure in running around us. 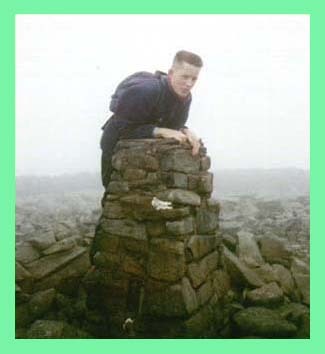 We found it most unnerving and were pleased when it got bored with its frolics - or was it the realisation that we were keeping our sandwiches for our lunch.Greg on the top of Foel Fras Aug 93. We reached the ridge at Bera Bach and sat just below its craggy top to have our first bite to eat. I can remember sitting there watching the mist getting worse accompanied by a decrease in the temperature. However, although the visibility was poor we knew, providing we kept to the ridge on roughly an east south east bearing, we would hit the main north to south Carneddau Ridge Path near Garnedd Uchaf. Somewhere on this mile trek to Garnedd Uchaf via peaty hags and a number rocky outcrops we must have passed close to Yr Aryg but the weather had not improved and we decided not to waste time to try and identify this minor top. The mists had cleared a little by the time we reached Garnedd Uchaf and we were able to see the North to South Carneddau Footpath, and some walkers looming out of the mist from the north and Foel Fras, which confirmed we were where we thought and hoped we were. The footpath made navigation easy and we went northwards on it to Foel Fras, which was a mile away. It took about 20 minutes to get there. However, by now the wind was blowing and the cold mist was clinging to our fleeces. Was this really August? The trig point at Foel Fras was a cold and dismal place and not a place to linger. The mist had not lifted despite the wind, and feeling cold we made our back to Garnedd Uchaf. From Garnedd Uchaf we continued southwards to Foel Grach and visited the "shelter" located just below its summit. Although it was very basic, in snow and ice conditions, the shelter could be a lifesaver to the lost or ill equipped mountain walker.We then followed the path towards Carnedd Llewellyn, which at an elevation of 3485 ft is the third highest mountain in Snowdonia. However, as the next top, and our last scheduled top of the day, was Yr Elen, which is situated to the west of Carnedd Llewelyn, we decided to skirt to the west of the mountain and hopefully pick up a path between these two tops. Unfortunately there was no helpful path or even a track to guide us and although we knew where Yr Elen should be we couldn't see it. In fact we could see very little. We therefore made the decision to climb to the top of Carnedd Llwelyn and take a compass bearing from the summit. We felt that the extra ascent would be better than the possibility of an unplanned descent if we continued on our current course. And so ascend we did and within 5 or 6 minutes we saw other walkers who had come from the direction of Foel Grach, and less than 10 minutes later we were in the "nest" of rocks on the summit of Carnedd Llewelyn. Here we met another walker who had started the day at Llanfairfechan on the coast and after visiting all the Carneddau 3000s intended to spend the night snuggled in his tent in the Ogwen Valley in the shadow of Tryfan. However, he had not yet visited Yr Elen and as he was about to do so we used his compass expertise to guide us there, although I'm fairly confident we would have found the way ourselves. Having found the way onto the rocky path between the two mountains, it didn't take very long to descend onto the arete between them before scrambling onto the top of Yr Elen. Here we said goodbye to our guide who returned to the main ridge to conquer Carnedd Dafydd and Penry Ole Wen. From Yr Elen, for us, it was, more or less, downhill all the way. We skirted to the north of Foel Ganol and continued in a west-north-west direction along the top of the ridge towards Gerlan and our transport back to base. And guess what? The sun came out and when we looked back the mist was beginning to lift and we could see mountains for almost the first time that day. Although we had done this walk without getting into any great difficulties it made us very aware of the fickleness of mountain weather. We were prepared for bad weather when we started out and we were equipped accordingly. However, had the weather been sun first and mist later it could have been very dangerous for the ill prepared walker. Not only would they have been very cold but lack of navigational equipment and basic skill could have made the visit very uncomfortable, if not fatal. It certainly made us more aware of mountain dangers and more prepared, and this, remember was August. In 1994 Greg was studying at Bangor University and needless to say one of the attractions of Bangor was the nearness of the mountains. 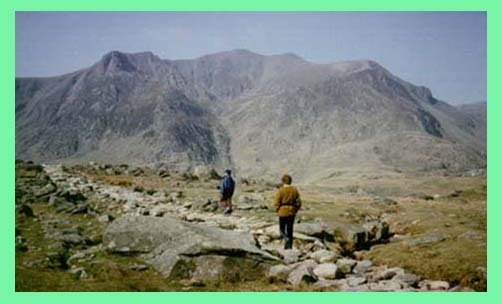 Often weekends would find him with friends visiting Snowdon, the Glyders or the Carneddau. Usually after these visits he would phone us when he got back to Bangor before celebrating that day’s achievement with a Chinese "takeaway" and a pint or two. However, one Saturday early in 1995 I had been talking on the phone for an hour or so to a friend at the time Greg would have normally phoned. When he didn't phone later in the evening we presumed he had tried earlier and having got the engaged tone gone for his normal "celebration". As he didn't phone later we presumed he had returned late and thought we might be asleep and did not want to wake us up. At midnight we listened to the news. Heavy snow had fallen on the Scottish Mountains, the Lake District and Snowdonia. Climbers were stuck on Snowdon. Later news stated that they were all o.k. So although we had not had a phone call we were not too worried. Shortly after 7 a.m. on Sunday the phone rang. It was Greg. "Hallo it's me. I'm all right. We're in the Llanberis Pass. We spent the night on Y Garn. We went up from Cwm Idwal yesterday morning. When we got to the top we were hit by a blizzard. We could only see a few yards in front of us." He continued about his "adventure" before getting a lift back to Bangor and a shower, food and a good sleep. He and one of his friends missed two days of lectures as they recovered from the ordeal. Although he'd never admitted to it himself he has told us that the other three had nightmares for some time about being stuck in a blizzard. It seems they realised, at about 4 p.m. on Saturday, that to try and get off the mountain, because of the poor visibility, could be very dangerous, so they decided they should make snow holes to shelter in. Greg, who had recently purchased a book on mountain leadership, was fortunately aware of the techniques of snow hole construction. With the help of two ice axes two, two person snow caves were "constructed" complete with ventilation to prevent a dangerous build up of carbon dioxide which could be fatal, particularly as they blocked the entrances to the "caves" with their rucsacs. Here the four sat and talked and ate their survival rations, which I understand included pieces of jelly and tinned tuna, while enveloped by bivy bags to help keep them warm and most of the dampness out.. - Greg has since purchased a "foam mattress" for future winter hikes as although a bivy bag can help to keep your body insulated from the cold air it does not stop the cold from an icy floor. During the night I'm told they looked out occasionally to see if the snow had stopped and could see the lights of cars in the Llanberis Pass - so near and yet so far away. The blizzard had stopped by first light and they left the "caves" at this time, about 6.00 a.m., for the short walk down to the Pass. Although the circumstances of both "trips" were different both illustrated how easily the weather can change and how essential it is to be prepared.. Whether it is winter or summer the mountains must be treated with respect and mountain walkers need to be prepared for the fickleness of the climate.